ST elevation in aVR is classically associated with left main occlusion, but can also be caused by severe triple vessel disease or diffuse subendocardial ischemia. This ECG is from a middle aged male who presented with diffuse pain on a background of sickle cell disease. This ECG shows LVH, diffuse ST depression with ST elevation in aVR and apparrent prolonged QTc due to U waves. The cause was hypokalemia (2.6). This ECG is from a woman in her 60s who presented with hypotension, bradycardia, chest pain and back pain. She had a history of aortic aneurysm, mechanical aortic valve and peripheral vascular disease. This ECG shows widespread ST depression with ST elevation in aVR. The cause was aortic valve thrombosis. This ECG is from a man in his 80s who presented with sudden onset chest pain and dyspnoea. 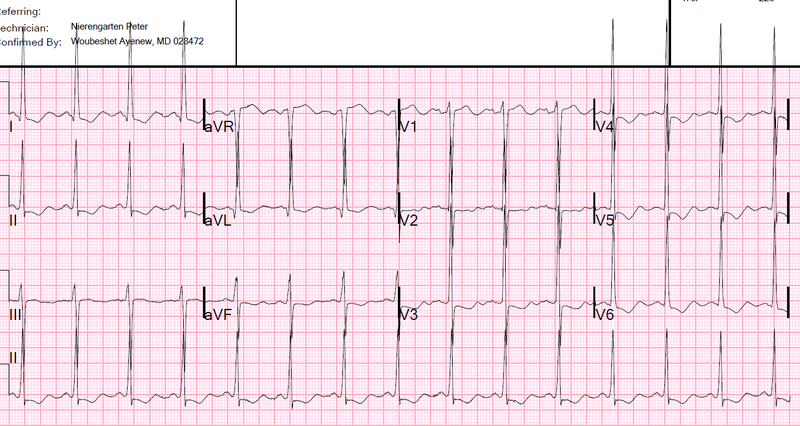 Cardiac arrest #3: ST depression, Is it STEMI? or is he an ACCESS Trial Candidate?